A second-half double consigned Sleaford Town to a disappointing 2-0 defeat at 10-man Peterborough Northern Star on Saturday. An even first half brought chances for both sides with Lee Barsby’s half-volley hitting the post for the home side midway through before Harry Millard responded for Town, bursting into the Star area, and shooting just wide of the far post. His strike partner Tom Siddons then hit a half-volley just wide from the edge of the area at the end of a swift counter-attack, but the half finished goalless. The home side upped the tempo after the break and Sleaford twice cleared off the line before the deadlock was broken on the hour. A free-kick into the box dropped to full-back Christian Gordon who smashed it into the far corner. Town keeper Kane Hutchinson-Wilkes made an excellent save to deny Barsby’s volley and then tipped Wilkins Makate’s header round the post. Paul Ward’s side were still in touch going into the last 10 minutes and twice went close to the equaliser, with Star keeper Dan George forced into a good low save with four minutes to go. But Sleaford’s hopes were snuffed out in stoppage time when Eric Makate was brought down and Jake Sansby stroked in the penalty. There was still time for the hosts to lose a player when Jezz Goldson-Williams was shown a second yellow card following the goal celebrations. Town stay 18th, seven points clear of third-bottom Boston Town who were beaten 1-0 at home by fellow strugglers Kirby Muxloe. On Saturday, Sleaford travel to Cogenhoe United, who sit just two places and seven points higher, hoping to avenge October’s 2-1 home defeat. Kick-off is 3pm. Town: K. Hutchinson-Wilkes, A. Forwood, M. Lynch, B. Machin, C. Ward, J. Braithwaite, D. Worthington, K. Elliott, R. Oliver, H. Millard, T. Siddons. Subs: J. Fenton, D. Hone, J. Smith. * Town Reserves had an afternoon to forget in the Lincolnshire League when they were thumped 6-2 at Eslaforde Park by CGB Humbertherm who leapfrogged above them into 11th. Thomas Buckberry and Mindaugus Hockus were on target for Sleaford who host Lincoln Moorlands in round two of the Supplementary Cup on Saturday, Kick-off 1.30pm. It was a better day for Sleaford Sports Amateurs in the county league as they shared the spoils in a 2-2 draw at home to Ruston Sports. Goals from Nathan Thompson and Jac Wright gave 10th-placed Amateurs a point. 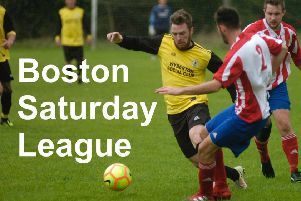 On Saturday they host Nettleham in the league (ko 2pm).